A great way to recognize an employee who has completed training for a course offered by the company is through issuance of a certificate. A certificate can serve as their proof of satisfactorily completing the course. A cost-effective way to have these certificates created is by simply having your own template to work on. The training completion certificate available for download on this page is free. It is easy-to-use and customize for each employee that successfully completes a training program. Compatible with Microsoft PowerPoint 2003 or later. Download the free template for the training completion certificate, and save it to a folder of your choice or direct to the desktop for quicker access to the file. Locate the file and open it to begin customizing the certificate with your own details. The first area you can change is the company name. Simply delete, and start typing in the name of your own company. 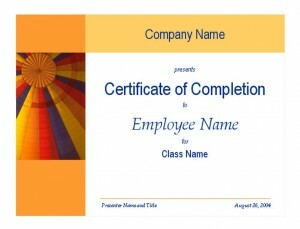 Other areas of text that you can customize include the employee name, and the name of the training program they completed. Enter the name of the employee first, and then the name of the course they completed. There is also an area for name and title of presenter. You can enter a name here or leave it blank so it can be signed by hand. The date can be typed in or can also be written in by hand. You can change the font type and the font colors on the training completion certificate to any other you prefer. You can also change the default image on the template and insert your own. You can insert the company logo if you want to instead. Print on cardstock paper for a sturdy certificate that the employee can put up on their wall if they’d like to. The thicker paper is best and less prone to tear apart. The template for the training completion certificate is a great way to create professional looking certificates to present to your employees. It can be used multiple times for any type of company training course.